Dress up like a real Dragon with this Fire Breathing Dragon onesie. Its lightweight cotton material allows you to feel free inside while you hunt around like a real Dragon does. 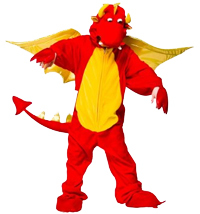 This Fire Breathing Dragon onesie would also be great for a fancy dress party, your child would defiantly make raise the temperature at the party in this onesie.